Virginia’s Kerr Lake / Buggs Island Lake is the largest in the state of Virginia, and should be kept in mind if you’re considering lake homes for sale. Kerr Lake is so large, in fact, that it spans into both Virginia and North Carolina, and sits on the majestic Roanoke River at the confluence of the Dan, Banister, and Roanoke Rivers, and is along the Southern Virginia Wild Blueway. Its impressive size, inspiring scenery, and bounty of recreation opportunities invite everyone to see for themselves what makes Kerr Lake so special. Once you see it, you won’t want to leave it! Kerr Lake rests in Mecklenburg County in Virginia and Vance County in North Carolina. Since John H. Kerr Dam – the 4th largest dam in the United States – was constructed in 1952, this lake has served as a recreation haven for locals and visitors alike. Besides being the largest reservoir in the state, Kerr Lake is also the only one in Virginia to house a naturally-reproducing population of striped bass. This is great news for anglers, who converge on the lake’s waters for its top-notch fishing. Largemouth bass hunting is always popular, as is the crappie hunting; the lake’s crappie fishery is second-to-none in the Southeast. Anglers can even find a healthy walleye population in the upper sections of the lake, and kayak bow-hunting has exploded recently due to the large population of gar. On any given day, you’re also likely to catch catfish and white perch – in fact, the world record blue catfish was caught on Kerr Lake in 2011, weighing in at 143 pounds! Keep to the southern part of the lake if you’re hunting for striped bass in the summertime; and if your heart is set on catching crappie, spring is the best season to cast your rod. Really, though, you’re bound to catch something rewarding any time of year! With 800 miles of protected, minimally developed shoreline to explore and 48,900 acres of crystal clear water surface to play on, you certainly won’t run out of room on Kerr Lake. Lake homes for sale are spaced around the lake, and they enjoy access to the many recreation facilities and services positioned around the water’s edge. Since you’ll find everything from sailboats to pontoon boats to Jet Skis dotting the lake’s horizon on any given day, it’s really convenient that public docks, marinas, and boat launches abound! Clarksville Marina sells everything from boat bling to fuel, and the Town Dock features 20 complimentary slips for day use. In 2014 Kerr Lake welcomed the newly opened Rudd’s Creek Marina, offering the largest boat slips on the lake, fuel, and a great waterfront store with snacks and boat supplies. Similarly, several public beaches offer irresistible plots of sand on which to sprawl out and settle in. There’s no shortage of things to see and do off the water as well. A number of lakefront properties dot the landscape along with well-maintained Corps of Engineers and State Park campgrounds that hug the shoreline, providing ample opportunities for picnics, games, and spectacular stargazing! Look to the skies when the sun is up and you might even spot a Bald Eagle. Several unique small towns dot the landscape around the lake, including Clarksville, Virginia’s only lakeside town. Here upscale dining, local crafts, year-round festivals, and a healthy downtown with a variety of shops welcome visitors and locals alike. Another great way to spend the day outdoors is on a local golf course. One particularly prized course is the Donald Ross-designed Kinderton Golf and Country Club. Kinderton is situated right alongside the lake, in Clarksville, and it indulges golfers with year-round access to their favorite sport. If you’d like to live on a Kerr Lake golf course, visit GolfHomes.com for property listings and details. Spend some time on Kerr Lake to understand why so many choose to never leave! At Kerr Lake, you can enjoy sailing, fishing, water skiing and camping. This 50,000-acre, man-made lake is a haven for water sports enthusiasts and landlubbers alike. The lake is situated in the northeast corner of the Piedmont region and covers both Virginia and North Carolina. The recreation area's headquarters are located near the town of Boydton at the John H. Kerr Dam. More than 800 miles of wooded shoreline provide access to a variety of fun-filled activities on the lake. One of the best fishing lakes in the eastern United States, Kerr Lake features striped bass, largemouth bass, white perch and crappie. Fish from a boat or nearly anywhere along the 800+ miles of shoreline. The fishing is rated as one of the best on the East Coast for Stripers, Catfish, Crappie, Bream and of course Bass. All the major professional tournament trail organizations, like B.A.S.S. and Operation Bass - Red Man / Everstart / FLW, make this lake a regular stop on their circuit. 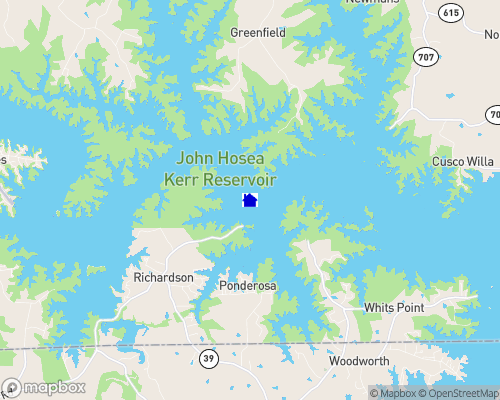 Fishing report: The great majority of fishing on Kerr Lake falls under the reciprocity rule between Virginia and North Carolina, so a valid fishing license in either state is good while fishing on the lake. A number of local fishing guides are available for novice or experienced anglers, including Elite Pro angler Rick Morris. Bait and tackle shops abound in the area, including the largest in the area, Bobcat’s Bait & Tacklein Clarksville. The U.S. Army Corps of Engineers owns and manages 17 free-access Wildlife Management Areas in in Mecklenburg County alone, offering over 9,200 acres of hunting and fishing opportunities. More information can be found about all of these Wildlife Management Areas. Enjoy boating throughout the year. Each recreation area has one or more concrete boat-launching ramps. Many recreation areas throughout Virginia and North Carolina provide 24-hour access to the water. Five commercial marinas; Clarksville, Occoneechee and Rudd’s Creek Marinas in Virginia and Steele Creek and Satterwhite Point Marinas in North Carolina, are open year round and offer mooring, slips, service and supplies. Distances and shorelines may be deceiving to the navigator who is unfamiliar with the lake. The Uniform Waterway Marker System has been installed for your safety. Obey all buoys and markers. Sailing: Prevailing winds offer ideal conditions for sailing enthusiasts. Sailing is excellent across the lake, and sailboats can go unencumbered for 25 miles from Clarksville to Satterwhite Point. Sudden wind changes and moderate lake waves are not unusual, so cautious seamanship is advised. Family Camping: Kerr Lake offers over 500 wooded tent and trailer campsites in Virginia alone, many of them on the water's edge. Both electric hookup and non-electrical sites are offered. Many of the electrical sites have hookups for water directly on the site, but some require up to 100 feet of hose to reach the water hookup. All campgrounds on the Virginia side of Kerr Lake are dog and pet friendly. The majority of the campsites have a picnic table, fire pit/ring or grill, and tent pad. Playgrounds, public telephones, hot showers, restrooms and dump stations are nearby. Campsites are available on a first-come basis for a fee. Reservations may be made for a stay of a week or longer at least one week in advance. On the Virginia side of Kerr Lake, the U.S. Army Corps of Engineers manages 4 waterfront campgrounds: Buffalo Park, Longwood, North Bend and Rudd’s Creek. North Bend is open year-round; the other campgrounds are open generally from April to October. More information on these campgrounds can be found here. Occoneechee State Park operates a campground and 13 newly built cabins on the lake, and is open year-round. They also offer a number of newly constructed equestrian campsites. More information about Occoneechee State Park can be found here. There are a number of North Carolina State Parks operating on the lake in North Carolina. More information about these can be found here. Boydton, Virginia, the county seat of is located, approximately, in the center of the county on U.S. Highway 58. Norfolk is 140 miles to the east, Richmond is 95 miles northeast, Danville is 60 miles west, and Raleigh, North Carolina, is 80 miles south. Boydton offers dining and limited shopping, along with several historic sites which include the beautiful 18th century Boyd Tavern. The last Saturday in October is known as Boydton Day. The fall festival became known when U.S. News and World Report (Nov. 21, 1977) called it, "The Little Town that Refuses to Die." Clarksville, Virginia’s only lakeside town, is located on Kerr Lake at the upper reaches of the lake near the confluence of the Dan and Roanoke Rivers. Several lodging options are available, including two waterfront hotels (the Lake Motel and the Magnuson on the Lake), and an award-winning bed & breakfast, Cooper’s Landing Inn & Traveler’s Tavern. Numerous shopping and dining options await visitors and locals alike along the quaint, healthy downtown. The Three Sisters of Shiney Rock Winery is located just a few miles out of town, and offers tastings and tours on weekends. South Hill is the area’s largest town, and is located on I-85 and Hwy 58, with easy access to Richmond, Raleigh/Durham, and Norfolk. A number of large chain hotels, many dining options, and chain stores such as Wal-Mart and Peebles offer modern shopping conveniences for visitors and residents in the area. VCU-CMH is the hospital that serves the region, and is located in South Hill. Plans for the construction of a state-of-the-art regional hospital in South Hill are underway and slated for completion by 2018. Lake Country Area Specialists. Let Our TEAM Work For YOU!